By the Right Flank, March! I finished up the first draft plan for Brian Brendel's new N Scale Mountain Sub Division layout, which is a later version of the Civil War era Virginia Central. The structures and details of some of the towns are still somewhat generic. We can improve them as information comes available. In the meantime, they have started work on the benchwork. I'll be heading out to Utah soon to confer with Brian to make any final tweaks to the plan. While I'm out there I'll also start painting backdrops. As I recall, this will be the third basement where I will have painted backdrops for Brian. It's always nice to practice on other people's walls. 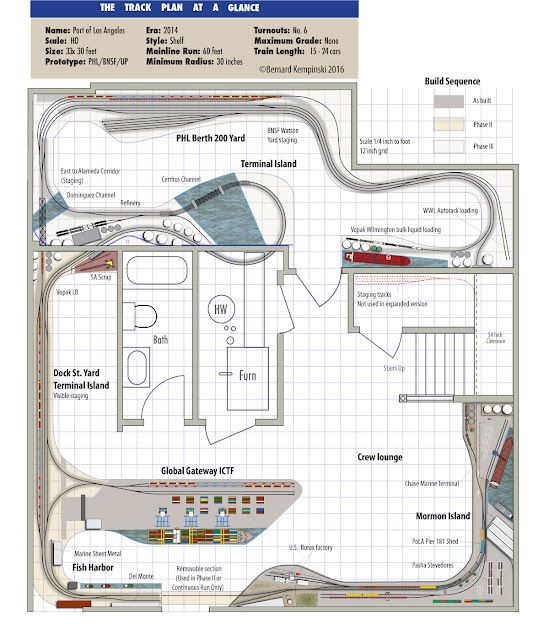 Tom Klimoski has built a gem of a layout in a relatively compact space. He has posted some excellent videos of it on his youtube channel. Here is one that shows a yard turn. 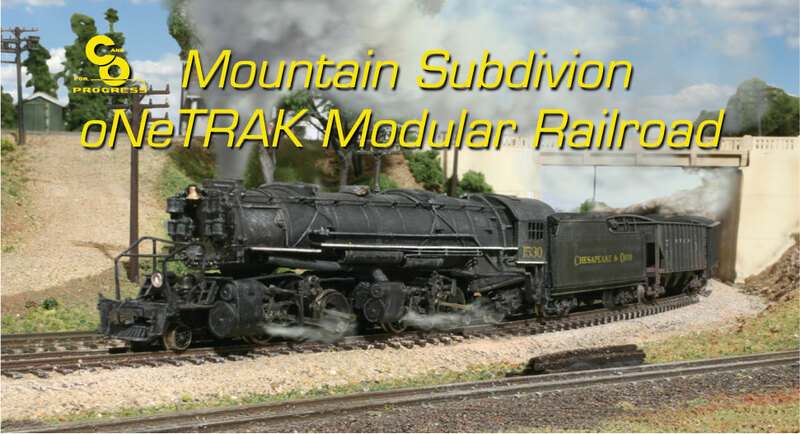 The video is well made and showcases the fine layout work. It shows that even a modest size layout can offer interesting operation, a lesson I am learning from my PoLA layout. I have not visited Tom's layout, but the video does a great job of conveying the scene and feeling of contemporary short line railroading. I just about finished the benchwork to the Borax factory extension. I widened the extension as it approaches the wall to create a little more room for the ship. The first image shows a cardboard cut-out mock up of the ship hull.While the extra width makes the aisle in that area a bit tighter, it allows for some open water between the aisle and the ship model. That should help prevent shoulders or loose sleeves from hit the ship as people walk by. I put the Danica Marie ship alongside the borax wharf to help visualize how the scene will look. This position of the ship allows the visitor to get a good look at it. I do like how the borax silos and the ship superstructure act as a view block when you stand in the central operating pit and look across the room. Once the spackle filler is dry, I'll sand and paint the fascia and add the dark blue color for the water. The Lyceum has finished the display case for the diorama I built for them. It is now on display in their exhibit hall. You can find it on the right as you enter the front door. Below is a video overview of the diorama and its construction. I Crossed the Rubicon on the Borax Factory expansion. I removed the existing sidings to the old Borax factory silos. This involved pulling up the track and one ME turnout. I scraped and sanded the surface to remove old ballast and pieces of Taskboard that I used for pavement. Then I installed a Peco Code 83 Number 7 curved turnout and one piece of Atlas code 83 flex track. I used an existing curve template that I made for my former N Scale layout to shape the 19.5 inch radius curve with some nice easements. The curve along the centerline of the track is closer to 20" as I laid the template along the inside rail. Before gluing it all down, I test ran some cars to see how it would look and work. These sidings will only see covered hoppers, so that is what I tested. They looked good rounding the curve. In this expansion I really like how the silos act as a bit of a view block across the cantilevered peninsula. No, not that kind of track mobile. This is a railroad trackmobile, a small locomotive that combines rubber tires and steel wheels. See the Trackmobile website for the interesting history of these neat little work horses. Rail King is another maker of these mobile railcar movers, and that is the kind that Rio Tinto has. I suspect that "Trackmobile" is a trademark, and that iswhy Rail King calls them mobile railcar movers. The company that makes Rail King, Stewart Stevenson, also makes the Army FMTV trucks. A few years ago, Broadway Limited Imports produced an HO scale Trackmobile in DC and DCC versions. Now that I have started to expand Rio Tinto-US Borax on my layout, the layout could use a Trackmobile. This photo shows the basic benchwork and mock up of the track, borax silos, pier side loading shed and the bulk carrier. It is hard to fathom that a ship this size is considered a "Mini-Bulker." This would be about a 10,000 - 15,000 DWT ship. Bulk carriers can get as large as 300,000 DWT! More on the bulker later. As you might be able to discern, the new sidings are about 60 percent longer than before. I got a Peco curved Number 7 turnout to tighten up the arc even more. On Saturday my mom and I took a ride in the Alkem-mobile to Mainline Hobbies in Blue Ridge Summit, PA. It's just over the Maryland border near Camp David. It's a nice ride once you get out of the city. The road from Thurmont to Sabillasville is twisty (time for sport mode), scenic and hosts the former Western Maryland East Subdivision. That line is still used by Maryland Midland. We like to stop at the Scenic View farmers market and get fresh produce- and yes, the corn was excellent. Mainline Hobbies is one of the nicest hobby shops in the United States especially for HO stuff (maybe the nicest with Caboose Hobbies shutting down). They had BLI Trackmobiles in stock. I got a yellow one with DCC, along with a bunch of other supplies. When I got home, I decided to test the Trackmobile. I really did not expect it to run very well. Wow, was I in for a pleasant surprise. The little engine runs great (see video below). It manages to traverse the dead frogs on the turnouts without a problem. It also had surprising pulling power. The only drawback is that it doesn't have sound. Nonetheless, I definitely plan to integrate it into the operations scheme. Plus, Alicia says, "It's cute!" I decided to proceed with a much more limited expansion to the PoLA layout. I ruled out the full expansion that I discussed earlier, at least for now. But, I want to try my hand at a larger ship model. Earlier, I had shown a drawing of portable module tacked on the left flank of the layout where my crew lounge couch is (see the dimmed out part of the plan below). While that plan would give me more tank car spots, I never really liked the idea that it would be over the couch, as I do use the couch for guests and the occasional movie viewing. If the module was portable, I would need to store it. If it was set up, the couch was compromised. With the left flank unassailable, I looked at a frontal attack, but that was quickly dismissed. Frontal attacks are almost always a bad idea especially since the room needs to be open in the middle for other uses. So, we got out our binoculars and took a good look at the right flank. Yes, we saw an opening. 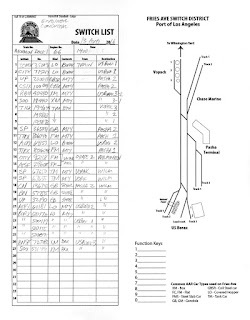 A few sketches showed that with a minimum radius of 19 inches for the tracks into silo unloading shed of the borax factory, I could expand the layout on the right flank and still have room for a fairly large bulk carrier ship. The ship would be about 52-56 inches long and have a beam of about 8.5 inches. That works out to a prototype length of roughly 115-120 meters. The added benefit on the railroad side is that the sidings would be long enough to hold 4 cars on each side of the loading shed. With that many cars it would make sense to include the trackmobile that the Borax factory uses to shift cars. This creates a new job on the layout - the Borax shifter using a trackmobile. The prototype uses a track mobile and a bucket loader for that task. An operating bucket loader would be a challenging task in HO Scale, but BLI makes the correct trackmobile with DCC, so that is a non-problem. The other aspect I like about this expansion is that it better reflects the large extent of the US Borax facility at this location. By adding to more space I will be better able to simulate the numerous buildings, sheds, silos, and ship loader that are there. The complex will look like a facility that needs serious rail and ship service. Google Street View of Front Loader switcher. Before proceeding I mocked it up using my camera tripod as a support. I lived with it for a few days to get a feel for the traffic flow in and out of my office. I was happy with it, but CINCHOUSE felt it was too much clutter. To keep a clean look I decided to try cantilevering the expansion without using legs. I used a 1x4 box beam screwed to the Ivar legs as the main cantilevered beam. I built a slightly wider 1x2 box on top of the 1x4 box, which matches the benchwork on the rest of the layout. I was pleased with how study it was. Nonetheless, I added one diagonal brace. I stained the brace black like the Ivar legs. The colored stain helps the brace visually disappear. To test the bench work, I bumped into it as if I was walking by. It held up nicely. I wouldn't walk on it, but it is plenty sturdy for the model trains. Once this expansion is complete, work will proceed on Aquia Landing. Look Ma, no legs! The 1x4 cantilever beam is visible on the middle right. 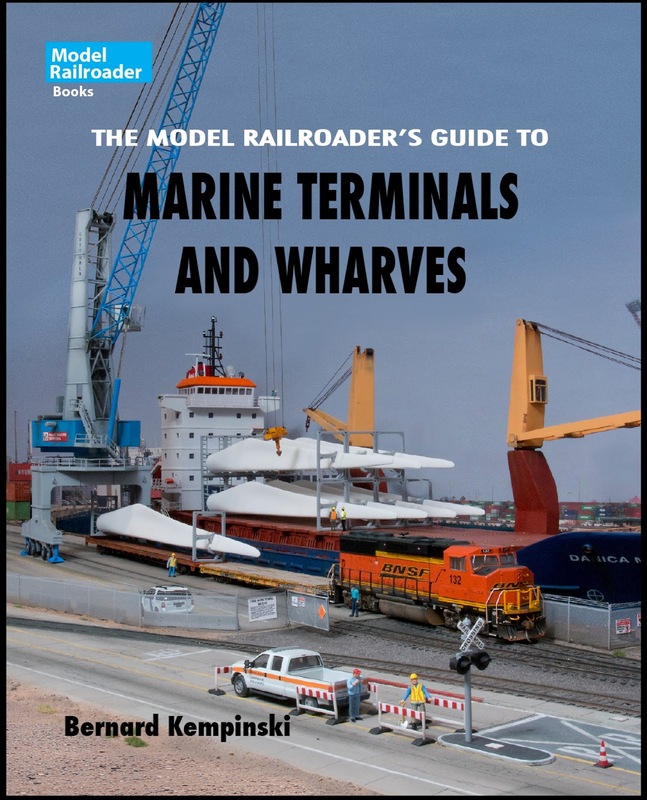 A video summary of the Port of Los Angeles layout. I plan to shoot some fresh clips later, but for now this is a quick summary of the prototype location, photos of the construction, and some video clips of the completed portions of the layout. We had a special crew visit the layout today and they achieved a first. My colleagues from work brought 4 of their children and two cousins to operate the layout. The oldest was Skyler at 8, the youngest was Esphan at 3. In between we had Arianna 8, Alexander A. 8, Alexander T. 6 , and Riley 6. These excellent operators were the first to run three trains at one time on the Aquia Line. With me dispatching and flipping switches, they each ran a train each way on the layout. They did great job. It was a hoot watching them run the layout. Alexander T. needed a stool but expertly handled the train. a chance to see the layout before heading back to Georgia Tech to finish his PhD. Later Norm Wolf showed up and I put him to work on the PoLA. He learned that when you are spotting cars, you must pay attention to the spots on the switch list. I have been catching up on some promised tasks. Two of those tasks are helping friends design their layouts. Yes, I love track planning. First is Marty McGuirk. He has reconfigured his layout again and wanted advice on how to fit the Essex wye in his revised layout. I had drawn a few iterations of this before, so this version in probably the fourth or fifth way we have tried to fit Essex in his house. The sketch in the upper left is a lift from an earlier draft. His initial reaction to the latest draft was not positive, so we will see how he develops it. The second plan is for Brian Brendel. He is a good buddy that moved from Northern Virginia to Utah. His new house is a dream home just off Weber Canyon about half a mile from the UP Transcon mainline. We call it "Schloss Brendel" as it is a stone covered beauty in the mountains. He has a HUGE basement, but is devoting only (!) about 800 square feet to his new N scale layout. The theme is east coast mountain railroading. Brian had a couple similar layouts when he lived in Northern Virginia. These photos are from one of his earlier layouts. He has started the benchwork on the new layout. My job was to help him figure out what to put on the benchwork. Knowing Brian and what he likes, I came up with this plan based on the C&O Mountain Subdivision. Brain, Matt Schaefer, Jeff Peck, I, and the kids used to model this region in oNeTRAK models. We have many fond memories of trips to this area and taking modules to shows. . The new plan is selectively compressed to run from the paper mill at Covington to Crozet. Brian had been building Crozet in his last layout, so it is a natural to include it. He also had a oNeTRAK module with the Blue Ridge Tunnel, so I included that too. The part of this plan I like the best is how JD cabin and the split from the Mountain and James River sub divisions are included in the design. Several years ago I scratch built the bridge over the James River at this location using photo etched brass. When I no longer had a need for it I gave to Brian. With this plan he has the perfect place for it! Brian and Michele stayed at the Hummingbird Inn in Goshen several times, so we had to get that on the layout. The N&W interchange in Waynesboro is freelanced to fit the space. In this design, the N&W switcher will come out of staging and work the interchange. So it will be a fun job. I should mention that Brian is getting into operations now that he lives in Uah and has met several of the serious operators that live out there. 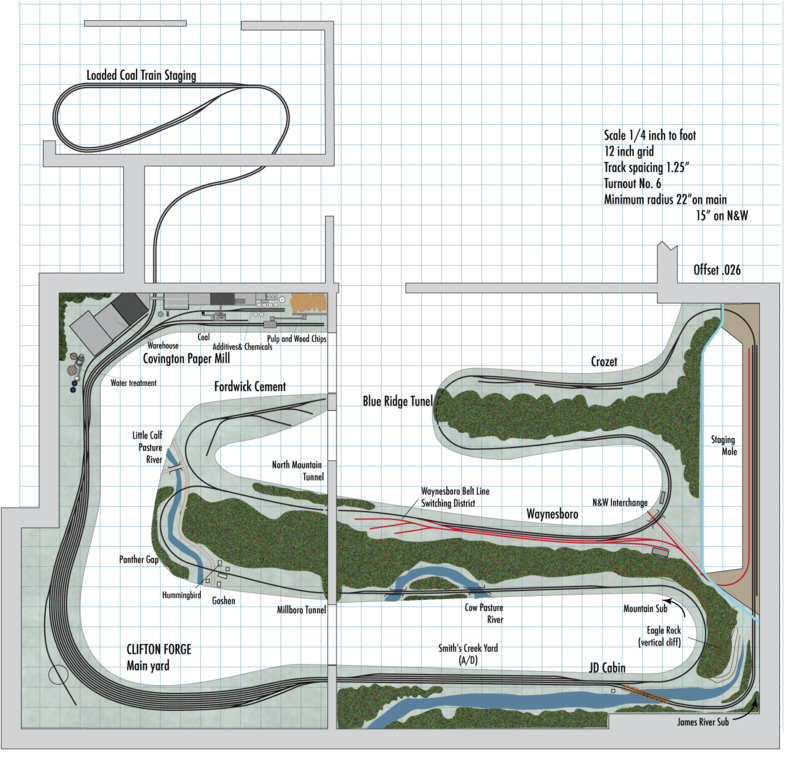 So his layout has to include loops for continuous running and good operation potential for the local operators. So here is the draft plan. It will be interesting to see how it evolves. This weekend Norm and Day Wolf will be visiting from out of town. I also will have some other visitors that want to see the layouts, including two 8-year old twins. That should be fun. In order to help Norm prepare, I sent him a copy of the switch list. I am posting a copy here if you want to try it yourself on paper. The only info you don't have is that there are a few cars on the layout that do not get pulled. That will complicate the task slightly. Right now the PoLA layout is a totally self contained and fully operational layout. 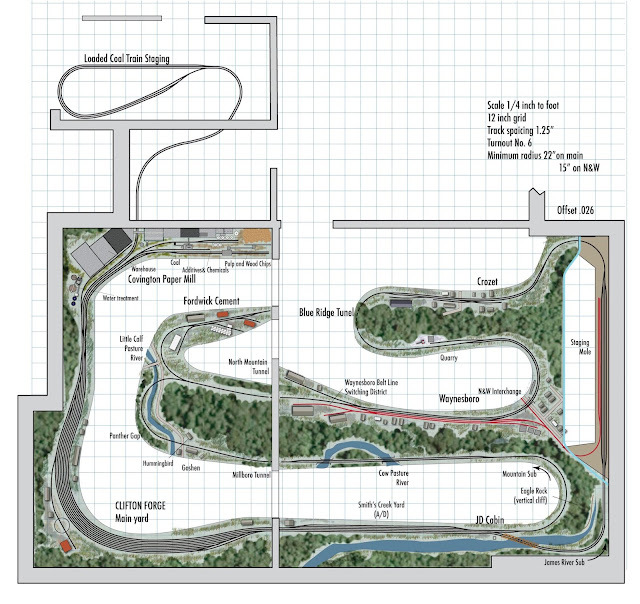 The small layout can provide a couple hours of switching operation with surprising long cuts of cars. In order to run more than two trains on PoLA (one on the layout and one in staging) I needed a better way to take cars off the model staging yard in order to exchange them with different cars. This is sometimes called "fiddle" staging. Others call it a "mole." Since this is such a small closet under my stairs, I call it a "mini-mole." I added a Super Simple Staging Shelf or SSSS to provide a place to put the extra trains. I simply added another wire shelf to the shelf rack. Then I secured two under cabinet LED lights that are chain able to the wire shelf with zip ties. To provide a solid surface I put a layer of 1/8th aspen plywood on the wire shelf. That's it. It took about 15 minutes not counting the shopping trip to Home Depot and ice cream with my mom at Coldstone Creamery. Now I have a place to store about 20 or more cars in order to make up different trains. There is just enough friction on the plywood that the cars don't roll once I made sure the shelf was level. Yes, I have been tempted to add a backdrop and scenery to the staging tracks. With the book done, I tinkered around a little bit more with the full expansion of PoLA design. This is a work in progress sketch. Compared to the previous design, the main change is in the crossing to Terminal Island. I moved the Cerritos Channel to the right, devoting more area to model the Cerritos Channel and bridges. To make room for the bigger channel. I moved The SA Recycle and the Vopak LB facilities to the workshop area. This adds two industries to Phase II that would require local switching, potentially making just Phase I and II more interesting to operate. 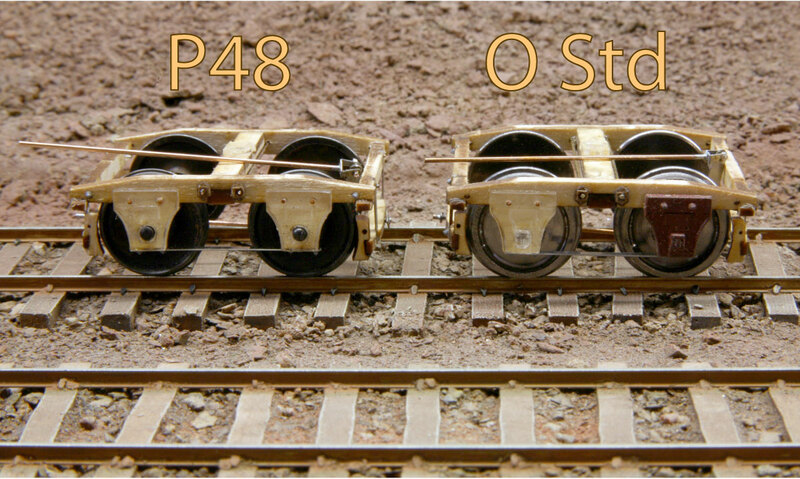 In Phase II the Vopak LB siding is a short stub track. If the layout expands to Phase III, that stub would be extended through the wall to connect to Watson Yard. Then the Vopak LB siding would have to be relocated. This arrangement of the two channels has several benefits. First it makes it easier to hide the holes in the walls, and second it allows space for a large refinery scene. Finally, it includes the Dominguez Channel and its bridge, while also allowing the Cerritos Bridge to be close to scale size. I also reconfigured the Vopak Wilmington facility with just one siding IAW the prototype. This area needs a little more design work to add an industry or two. 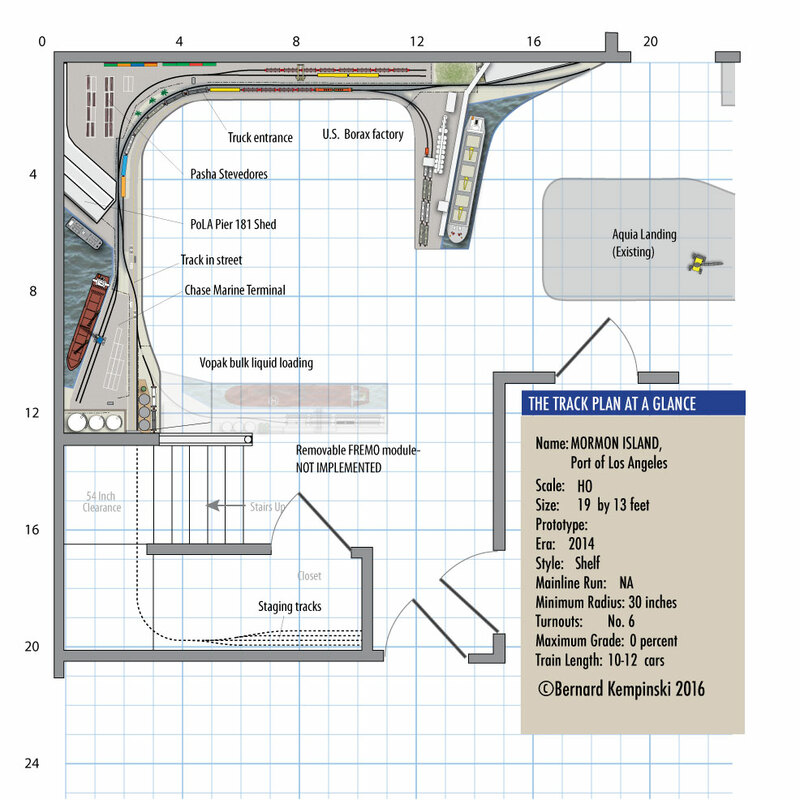 The PHL yard needs more design work to incorporate the engine terminal. The Fish Harbor area would represent an earlier era when it saw more local rail traffic. The industries there now are either out of business or not rail served. The staging yard concept for this layout is very abstract, compared to the Aquia Line that is very simple and literal. In the expanded PoLA plan there are two visible staging yards, Watson for BNSF and Dock St for all others. Watson yard is where BNSF trains get staged, with room for up to three trains. BNSF Trains would run from Watson Yard to PHL Yard, before heading to Terminal or Mormon Islands. Dock Street Yard is the other visible staging yard. Dock St Yard represents different places depending on how you arrive there. If a train arrives at Dock St via the bridge over Dominguez Channel, it serves as the rest of the world, which happened to be east of here. 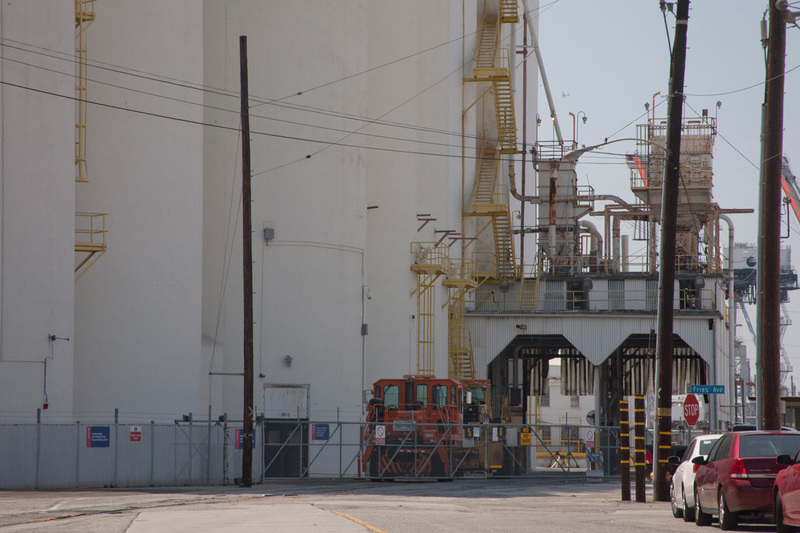 If the train arrives at Dock Street via the Cerritos Channel bridge, it is the small waiting yard on Terminal Island. One or two of its tracks could also be used as Terminal Island slough tracks for use by switchers working the Global Gateway ICTF, Fish Harbor, SA Scrap and Vopak LB. Trains would not normally go from the Dock St Yard to Watson Yard in an op session, but they would during restaging. What would an op session look like? It would start off with two trains in Watson Yard, and one or two in Dock St. In Berth 200 yard would be cars that need to be sorted into trains to head to Mormon Island and the Terminal Island industries. Mormon Island would have cars awaiting pickup as would the industries on Terminal Island, including a container train at the ICTF. The PHL switchers would make up the Mormon Island and the Terminal Island locals, called dock jobs. Once they go out, trains from BNSF Watson yard and from Dock St yard representing all points east would arrive in the yard for sorting by the PHL. A westbound container train would travel from Dock St to Berth 2000, and then back to Terminal Island via Cerritos Bridge. Yes, they do back long container trains into Terminal Island. 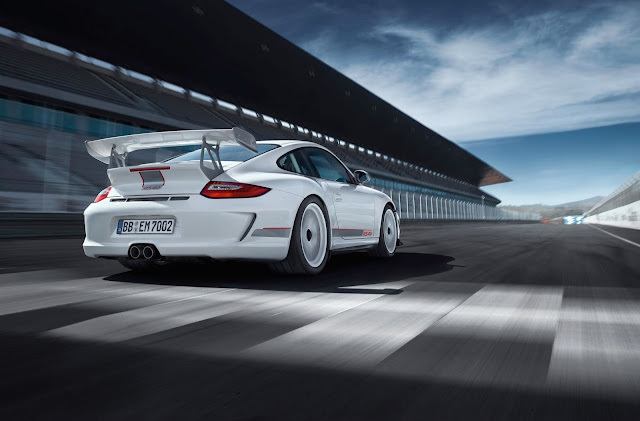 It would swap cars at the ICTF and retrace it steps. Alternatively, it could drop off cars and return light. PHL could also send a light engine to the ICTF to pick up a container train. So, container trains would be doing some switching on this layout and not just run through. It should be noted that PHL handles approximately 1.2 million double stacks, and 40,000 merchandise cars in a year. So any PHL layout has to include a steady stream of container traffic in some way. It might be worth exploring using the continuous run track to add more container train traffic. I need to think about that some more. 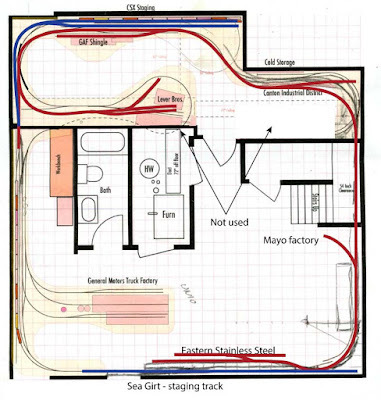 This layout plan offers a lot of modern railroad action. Book 5 is done, so what have you done for me lately? Book 5 is done and on the way to the publisher. They said it was due to the printer in October. We'll see how that works out. This book was a lot of work, but also a lot of fun. 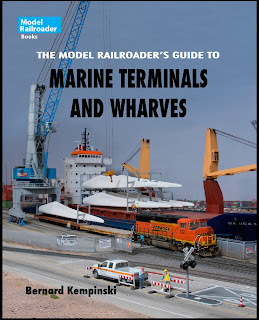 I learned a lot about marine terminals and how to model in HO Scale. I am pleased with how it came out. 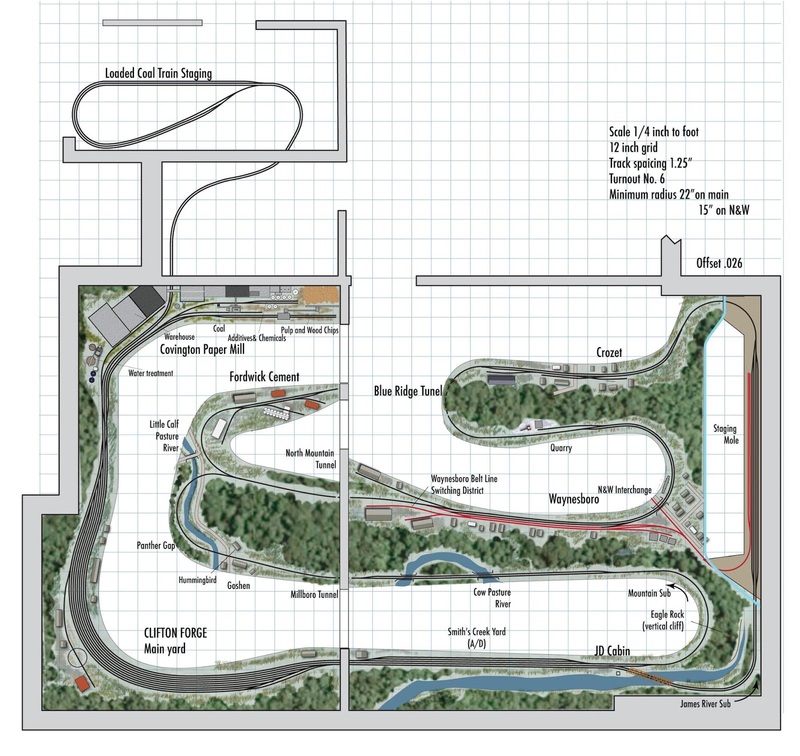 The book includes 11 new track plans as well as a project layout with some how-to information. Now to take a breather and then decide on what is next. I have a few projects on the back burner for Alkem Scale Models that I want to get moving on. The PoLA layout still needs to have the Borax factory completed. The BNSF slab cars are on the do list. I am trying to decide the best approach to modeling it. A mostly photo etched kit would probably be too light. I am thinking about spin casting some of the parts. But which ones. It will be an interesting task to design and produce. That got me wondering about what kind of P48 layout I could build in my basement. My current Aquia Line layout is not P48. It is a hybrid using Standard O gauge with hand laid track and standard O gauge wheelsets. The track gauge is 5 feet. That would be just right for a Western Atlantic or other southern civil war era layout, but the USMRR used 4'8.5 inches. In an ideal world I would have gone P48. Truthfully, I'm not sure my track laying skills were good enough. By using code 100 rail, and all wood ties with 4 spikes per tie, the track looks good to me and I am happy with the decision. Anyway, back to P48. 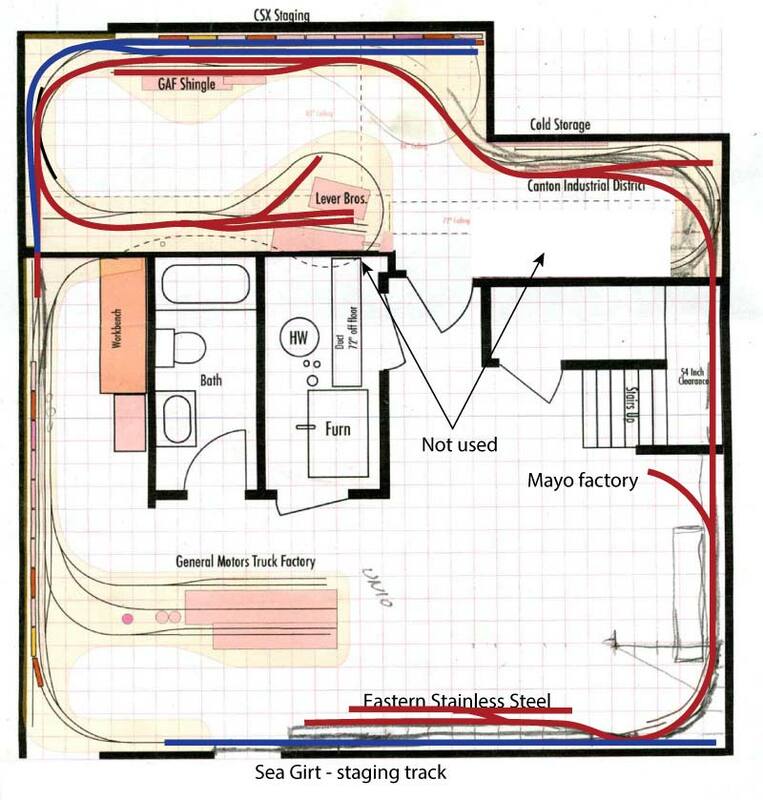 As I wondered about it, I drew this basement filling plan for a P48 layout based on the Canton RR in Maryland. It is one of my favorites short lines. 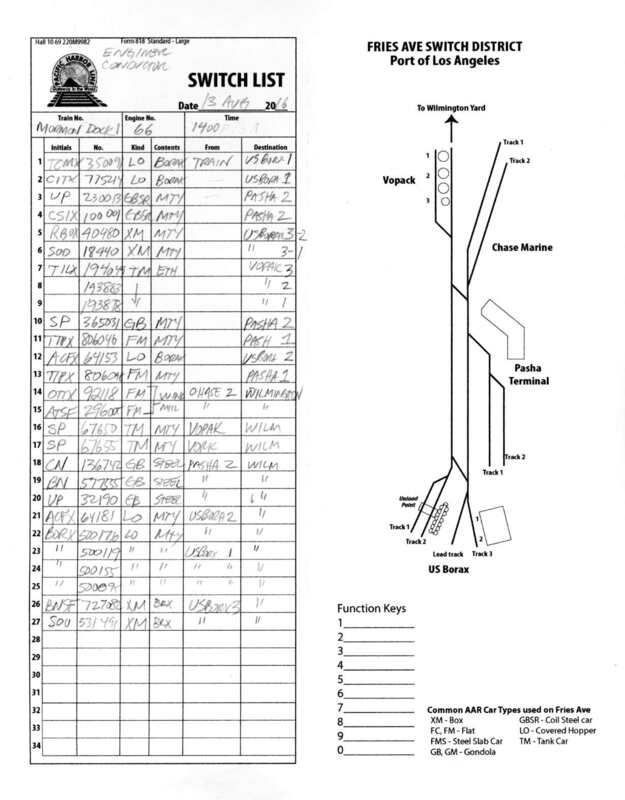 I have a track plan in my latest book on the Lever Bros plant. In my upcoming book, there is a more extensive Canton plan in N scale. In looking at the P48 plan I realized the turnback loop at the Lever Bros and the loop into the shelf where I now have Falmouth would never work in P48, especially P48 set in a more modern era around the 1990s. So I never went any further with the design. A few weeks ago, Jeff Peck and I were discussing the plan and I look another look. To make the plan work I would have to give up the loops. 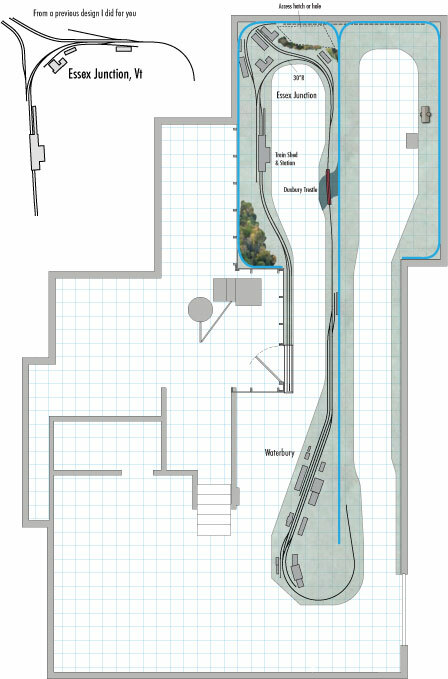 The main line would follow the perimeter of the wall. I annotated the plan with the dark colored lines, blue for CSX and red for Canton. It's a pretty simple layout. The Canton RR does most of the work, though CSX would switch the GM plan and a hint of Sea Girt. The plan would not require a lot of rolling stock. 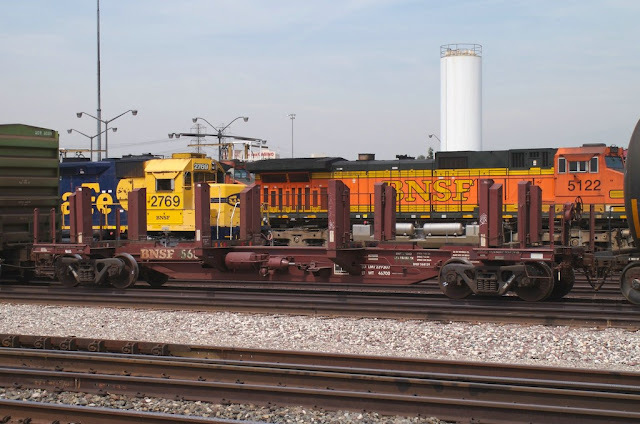 One Canton SW-1500 or GP-15 and perhaps two CSX locos (4 axle to handle the tight radii) would comprise the engines roster. About 40 freight cars would be needed for work. I hope you found this think piece useful and enjoyable. The opportunities for P48 are intriguing, but in most cases, you have to be very careful in your layout plans to accommodate the large radii and turnout number needed for good operation.